As a defensive end in college, Maxwell accounted for 28 sacks and 348 tackles. He received honorable mention All-American honors in 1980 and ’81 and was a consensus first-team choice in 1982. The Colts chose him in the second round of the ’83 NFL draft, where he was reunited with Head Coach Frank Kush, who had recruited him to Arizona State, and Maxwell moved directly into the starting lineup at outside linebacker. Colts went 7-9 to finish fourth in the AFC East. 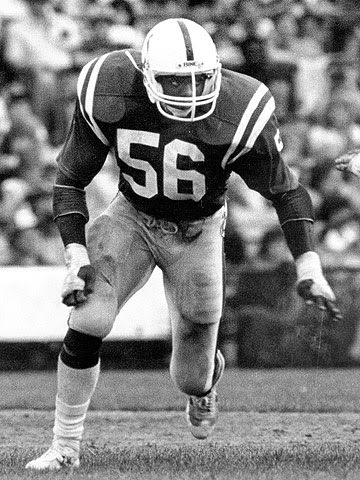 The Colts moved to Indianapolis in 1984 and Maxwell was part of a good group of linebackers, contributing 8.5 sacks. However, his tackles dropped to 53 and, with rumors of off-field problems, he was traded to San Diego during training camp in ’85 but was waived prior to the season and picked up by the Detroit Lions, appearing in nine games. Maxwell played two more inconsistent years with Detroit and also was with Seattle in 1989 and the Hamilton Tiger-Cats of the CFL in 1991 and ’92. Overall, he appeared in 77 NFL and 14 CFL games and recorded 19.5 of his 21.5 NFL sacks with the Colts, never again approaching the level of performance of his rookie season.